After adopting a sibling group of three boys 6 years ago, then age 4, 5 and 6, our journey has been challenging and rewarding. Our oldest son was diagnosed with Severe Attachment Disorder and at the age of 9 our local primary school wasn’t able to manage his challenging behaviour. This was a very difficult time for us as a family. We were first able to see the "light in the tunnel" when he started at a specialist school, Gloucester House Day Unit, part of Tavistock Portman NHS. At this school he was able to access intensive psychotherapy and group therapy in addition to education. In the Channel 4 documentary "Kids on the Edge: Last Chance School", premier at 10pm on Wednesday 23rd November (available on catch-up) , they have looked at the great work Gloucester House is doing for children who in most cases has been excluded from a mainstream school. The documentary is directed by BAFTA-award winning Peter Beard (My Son The Jihadi) and following three children, one of them is our oldest son. Phill and I agreed to take part in the documentary to give other parents in our situation hope for their children's future. We would like to raise awareness of Gloucester House and the positive impact it has had on our family. Without the help from Gloucester House our family situation would be totally different, for almost 4 years ago we were close to an adoption breakdown. In addition to the therapeutic educational work they did with our son, Phill and I accessed therapy to get through a very difficult time as a family. We hope the documentary will increase the level of understanding and also help to secure funding to services like Gloucester House. We need to invest in our children's future! It's not our son's fault he had a difficult start in life, so it’s our duty to help him in a way so he can have the same bright future like most children in the UK. This service should be accessible for everyone in need of it! “Children who haven’t had a great start to life, like myself, have to see that there’s still hope and still a good chance to grow up to be a nice adult and have a great life like I have” answered our oldest son on the question, why he wanted to take part in the documentary. 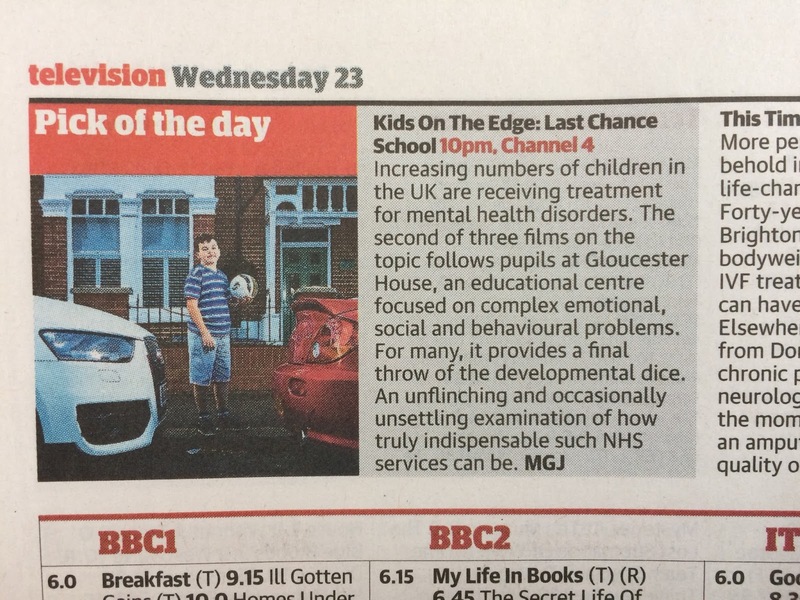 "Kids on the Edge: Last Chance School" was filmed up to the summer 2016 before he started mainstream full time. Our son has now settled into a secondary mainstream school and is doing great. We still have challenges, but the future is bright! See my vlog about our sons transition to mainstream secondary school.